Throughout the first semester of our 2015-2016 season, Madison Youth Choirs singers have been discovering connections between scientific and musical inquiry, using the tools of observation, experimentation, and analysis to reach a deeper understanding of our diverse choral repertoire. Along the way, they are also learning from the world-class scientists who serve as our guest artists (both in-person and through our science and music video series) including UW Chemistry professors Dr. Bassam Shakhashiri and Dr. Sam Gellman, Hydrogeologist Mike Parsen, UW Space Place Director Dr. Jim Lattis, and UW Engineering professor Dr. Amy Wendt. As we incorporate scientific methods and ideas into the study of music, our singers are also recognizing the essential role that resilience plays in both scientific and musical fields, learning how to work through moments of frustration and uncertainty to reach new discoveries. 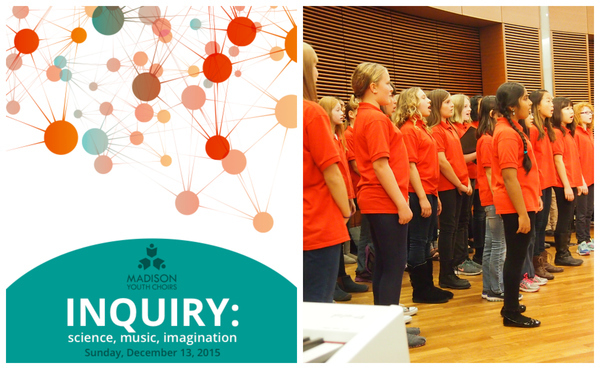 We invite you to join us for the culmination of this semester-long exploration, our Winter Concert Series, “Inquiry: Science, Music, Imagination” on Sunday, December 13, 2015 at First Congregational Church in Madison. 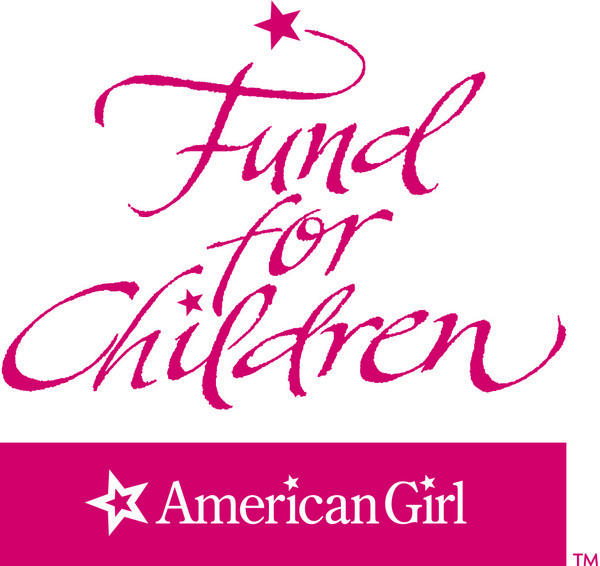 This concert is generously endowed by the Diane Ballweg Performance Fund with additional support from our sponsors, American Girl's Fund for Children, BMO Harris Bank, Madison Community Foundation, and Wisconsin Arts Board. Concert details and ticket information are included in our Upcoming Performances section below. Following our fantastic experience at the 2014 Aberdeen International Youth Festival, we are thrilled that our girlchoirs Cantabile, Cantilena, and Capriccio have been invited to perform in the 2016 festival. The festival will once again be an outstanding opportunity for our singers to collaborate with fellow young artists from around the world, sharpen their musical skills and develop lifelong memories. A wonderfully generous anonymous donor is helping to make this experience possible for all eligible singers, including those who face financial challenges, through a major matching gift. From now through December 31, all donations to the Scotland Tour Scholarship Fund will be matched 1:1, effectively doubling every dollar contributed towards this $20,000 goal! If you would like to make a secure, tax-deductible contribution to the fund, you may visit our online donation page and write in “Scotland Tour Scholarship Fund” on the designation line of the form. You may also mail a check to the MYC office with “Scotland Tour Scholarship Fund” written in the memo line. Thanks to the many families and past tour participants who have already kick-started this ambitious effort! 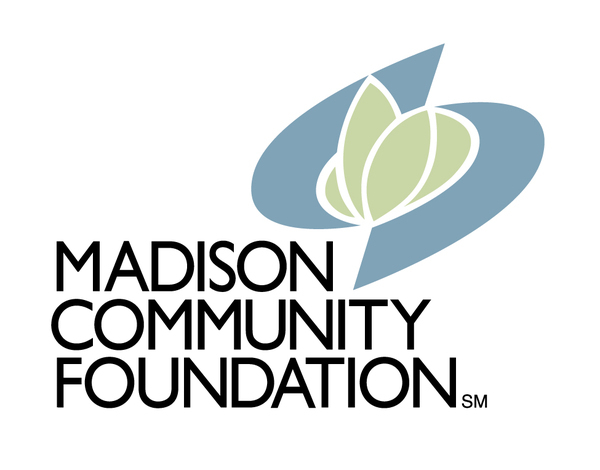 Last January, we kicked off a two-year “Capacity Building and Community Building” project, generously funded by a grant from the Madison Community Foundation, to reach a wide variety of new singers and further strengthen our efforts to break down barriers to arts participation. This project has allowed us to expand our in-school choir program, developed in collaboration with Madison Metropolitan School District, to a fourth school, Leopold Elementary, bringing the total number of students in this program to over 250! 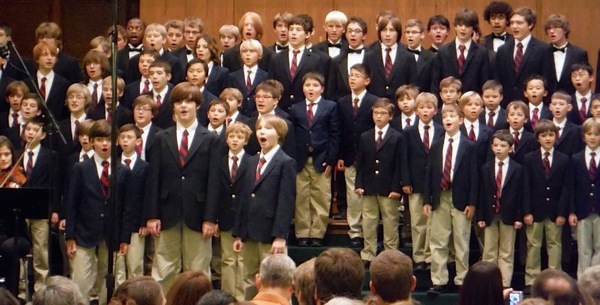 Many of the students in the four choirs at Lincoln, Chavez, Nuestro Mundo and Leopold had never previously sung in a choral ensemble, and many had not had significant access to live performing arts experiences. All of these students are now impressing their conductors and music teachers weekly as they learn to sing in canon, sharpen their sight reading and listening skills, and project confidence and poise as they share their talents. The grant has also enabled MYC to offer choral enrichment programs at the Lussier Community Education Center, which will continue again this spring, and create a new intergenerational choir program (pictured above) blending the voices of teen singers in MYC with senior residents of Capitol Lakes Retirement Community. Read the Wisconsin State Journal's recent article about this program here. The choir is now wrapping up its third session with a concert scheduled for Saturday, November 21, 7pm in Capitol Lakes Grand Hall. Our singers will have the thrilling opportunity to work alongside many professional musicians this season as we engage in a record number of collaborations with fellow arts organizations in Madison. Several MYC singers appeared in Madison Opera’s La Boheme this fall, and various members of our choirs will perform in upcoming productions with Madison Symphony Orchestra, Madison Bach Musicians, and the presentation of an international research project, “Performing the Jewish Archives.” More information and performance dates are listed in our upcoming performances section below. In addition, we’ve partnered with Madison Ballet and Wisconsin Youth Symphony Orchestras to create a new ad campaign and website, madisonyoutharts.org. You may have seen our "Sing. Dance. Play" billboard on the beltline just off of I-90, or our poster at Hilldale Mall. 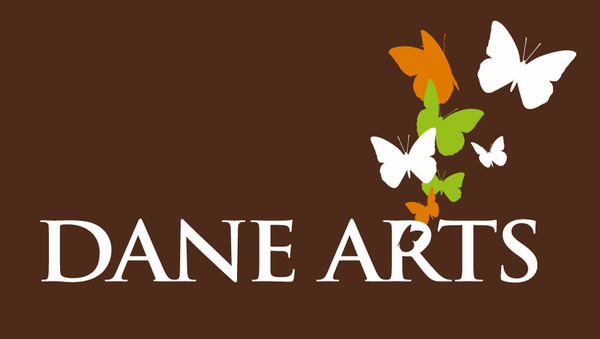 As the website and the partnership become further developed, we hope to offer families a simple starting point for exploring information on performing arts education in our community, supporting the work of our colleagues and increasing the collective impact and visibility of youth arts in our area. Our MYC singers and alumni often tell us that the choral music we study in rehearsal leaves a profound impression on them, resonating for years after their concert performances and impacting their lives in unexpected ways. 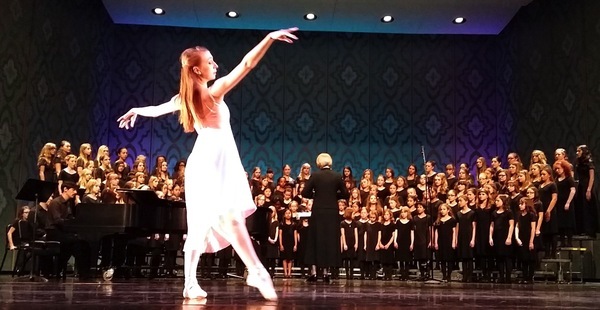 While we now know of the powerful effect that our choir programs have on young people, we are beginning to discover that the work of our singers has a far broader reach than we ever thought possible. While sitting in the hallway outside a boychoir rehearsal one night, MYC parent and New York Times bestselling author Jennifer Chiaverini was struck by the unique ability that music has to connect individuals across the centuries. She was in the midst of writing a novel whose chapters alternate between Civil War-era Cambridge, Massachusetts and present-day Boston, struggling to find a way to transition between the time periods. Suddenly, as she listened to the boys of Britten bring a lively contemporary relevance to an ancient melody, she realized that she could unite the protagonists of her novel, 19th century poet Henry Wadsworth Longfellow and several 21st century narrators who engage with his work, through song. Chiaverini’s resulting book, the recently published Christmas Bells, links these individuals, separated by 150 years, by focusing on Longfellow’s creation of the titular poem (“I heard the bells on Christmas Day/their old familiar carols play”), and the meaning his words have, generations later, on the audience and singers of a church choir who perform the well-known carol the poem became. We’re honored that MYC played a role in inspiring this acclaimed new novel, a great reminder that our programs can have an impact in ways we never imagined! Singers ages 11-18 are invited to audition for our winter/spring 2016 semester on Wednesday, January 6. There is no cost to audition and no preparation required. Singers can sign up for an audition slot on our website. As we dive into this semester of discovery and experimentation, we are especially thankful for the donors and sponsors that allow us to create innovative new programs, expand successful initiatives to serve more young people, and ensure that no student will ever be denied an opportunity at MYC due to their financial circumstances.